Before World War II, international cooperation among scientists was free and open. The war changed all that. The race for the bomb cultivated a scientific atmosphere of secrecy. On December 8, 1953, President Eisenhower, in an effort to restore international scientific cooperation, proposed an Atoms for Peace program in which the United States would help other nations to harness the power of nuclear energy for peaceful uses. Two years later, Argonne established its International School of Nuclear Science and Engineering. Its first session began on March 14, 1955. In attendance were 40 students from 20 countries, all from industry. President Eisenhower told the group, “You represent a positive accomplishment in the Free World's efforts to mobilize its atomic resources for peaceful uses and the benefit of mankind.” At the school, seven-month courses covered unclassified theory and technology of reactors. In 1956, a low-cost training and research reactor—Argonaut—was designed based on a series of multiplication experiments. It achieved criticality in 1957 and became a key training facility in Argonne's International School. By 1959, Argonne had trained 420 students from 41 countries, including the United States. When the school closed in 1965, 800 students from throughout the Free World had participated in the training program. 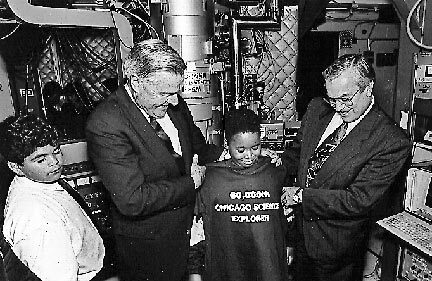 In 1968, the Argonne Center for Educational Affairs was established. Within this center, training courses in nuclear technology began in 1976, with sponsorship by the U.S. Department of State in cooperation with the International Atomic Energy Agency. All educational activities were consolidated into the Division of Educational Programs in 1980. Today, more than 2,000 participants from foreign countries have completed training offered by the division in radiation protection, nuclear safety and energy planning. Argonne's excellent reputation in training and educational enrichment is neither confined to the international sector nor to a particular period. The lab's educational division has been called by many the "flagship" among the science education programs offered at U.S. Department of Energy national laboratories. For example, the lab conducts the largest DOE-sponsored undergraduate research participation program in the nation. Each year, hundreds of students are mentored by Argonne scientists and engineers. The program, which encourages young people to enter technical careers, has been very successful. Argonne has played a lead role in establishing this program as well as others such as the Science Bowl, Community College and Technical Institutes Initiative, Science and Engineering Research Semester, and Industry/Argonne Internship. In focusing on females, Argonne established in 1990 the conference series Science Careers in Search of Women. Each year nearly 500 young women and teachers interact with Argonne scientists to explore career opportunities in the sciences. Argonne provides learning experiences for pre-college students and teachers. From the Argonne-developed Science Explorers Program, which has had an impact on more than 100,000 students throughout the nation, to more recent programs like the telecommunications training courses for teachers, the laboratory makes major contributions to the nation's educational systems. Reactors Designed by Argonne National Laboratory: Training - Reactors designed and operated by Argonne as a resource for training students and/or technicians.